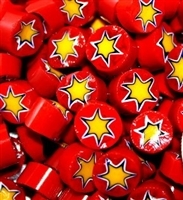 Star..U42..8-10mm New! Star..T22..6-7mm Back in stock! Star..U35..7-8mm Back in Stock! Flower..54..6-7mm New! Star..T58..6-7mm Flower..T58..2-3mm New Size! Red/black/yellow. Picture taken after rinsing a little dust off the mille. Also available in 3-4, 2-3, and 8-10mm sizes. Star..U68..4-5mm NEW! Star..S41..8-14mm NEW! Star..U68..7-8mm NEW! Cobalt/yellow star. This pic taken after washing the millefiori which will be a little dusty in the bag. Also available in sizes 3-4mm, 6-7mm, and 7-8mm. Also available in sizes 3-4mm and 6-7mm. Star..U35..8-10mm NEW! Star..T58..3-4mm Back in stock! Star..U68..8-10mm NEW Size! Our biggest size yet for this black/white star pattern. Also available in smaller sizes. Cobalt/yellow star. This pic taken after washing the millefiori which will be a little dusty in the bag. Available in smaller sizes, too. This pattern has been added to the Flowers category because of its size. Includes all 5 and 6-point stars that are in stock and many starburst patterns.